It’s not every day you get to stay in a former palace. In fact, it’s really so much rarer than it was in, say, the 15th century. 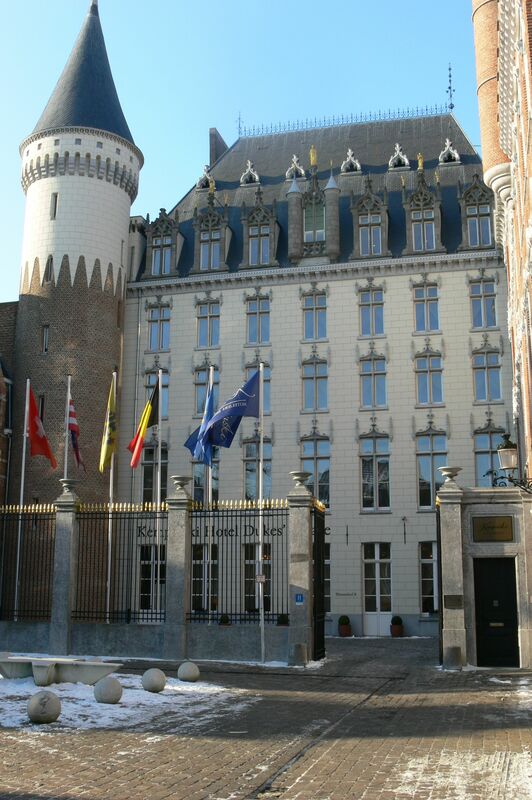 So it was with great excitement that the boy and I recently headed to the Kempinski Hotel Dukes’ Palace in Bruges. I was doing a review of it for the Arbuturian magazine and we were determined to soak in all the luxuriousness of the hotel’s surroundings during our stay. Now, I’m not exaggerating. The hotel really is a former palace. It was built in the late 15th century by Philip the Good, a duke of Normandy, for his wife, Isabella of Portugal, and served as their family’s home until the 17th century. 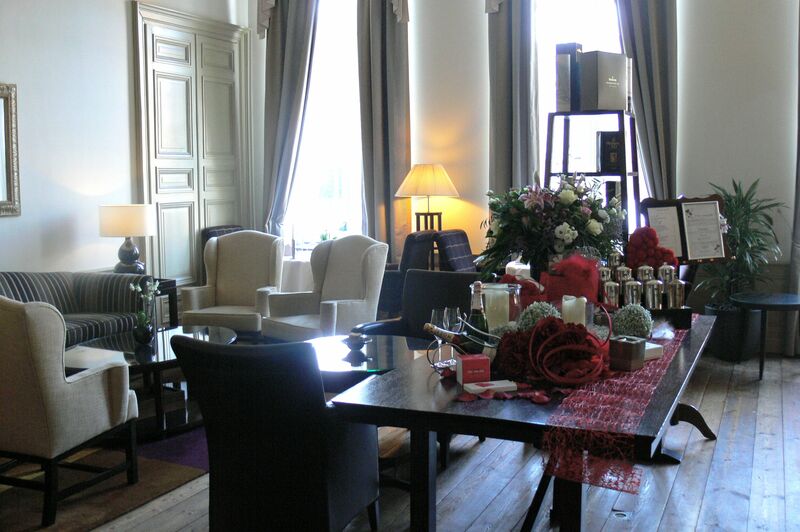 More than 500 years on, after a six-year renovation, the hotel now acts as one of the top spots to stay in Bruges. And it is a sight to see. With soaring turrets and a gold gated entrance, one feels regal just stepping onto the property grounds. Inside, a stretching, swirling staircase catches the eye, while a modern-art inspired bar and lounge await just off the entrance. Up the stairs, one finds floor after floor featuring extensive stained glass windows that look out onto the hotel’s frontage. I managed to catch a glimpse at sunset and, pausing in silent wonderment, I breathed a quiet sigh as the white tower began turning gold and pink. On a tour of the hotel, I found the stained glass and historical elements continue throughout – downstairs sits a chapel, in which classical concerts are sometimes held. Every surface still holds frescoes painted when the palace was first built, while a gargantuan stained glass window flicks green, gold, blue and red lighting around the room through its panels. Our room – in the old part of the hotel – reminded me of my own internalised visions of how the Tudors lived: over-sized feather bed, gold and red striped walls and lounge chairs, heavy bronze hanging drapes. The only difference: the Tudors were unlikely to have such a grand bathroom with soaker tub, rain shower and heated floors. Pure and utter opulence. 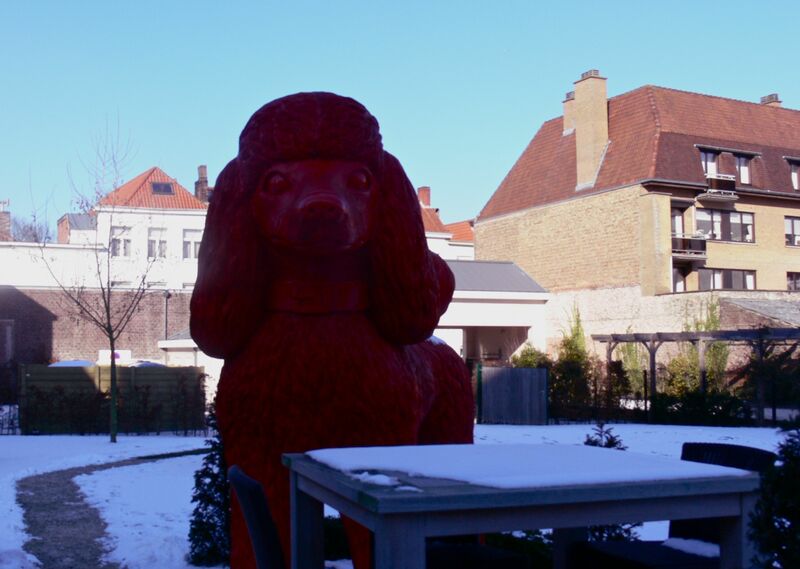 A look outside of the petite windows revealed an Alice in Wonderland scene: large tables sat amongst the trimmed green grounds flecked with snow, while a giant pink poodle (a recent installment) watched over it all. But one of the best parts came the next morning. Having never had room service in a 5* hotel before, I thought it would be a real treat to finish up our stay in Bruges. 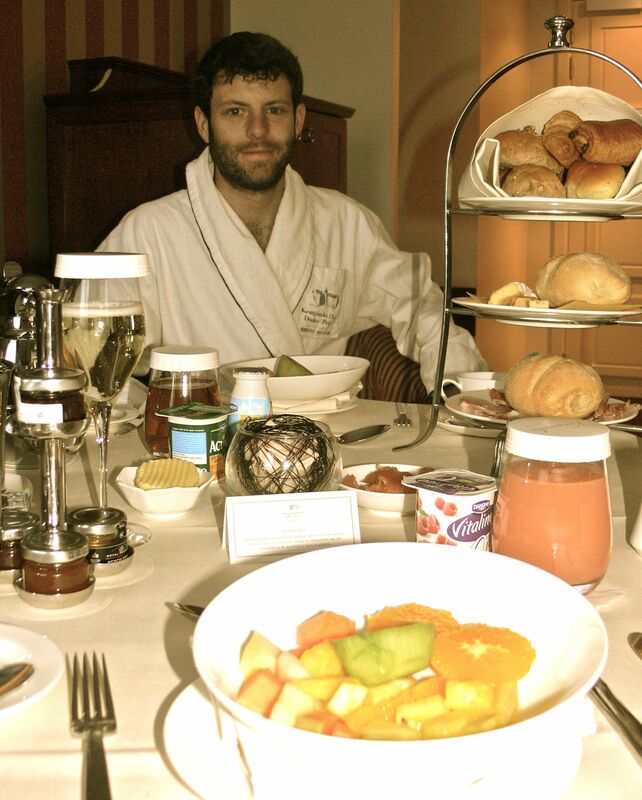 And so, as the boy and I sat in the plump chairs in our cushy bathrobes, drinking champagne and eating eggs, I realised this was about as pleasurable as it gets in a hotel. Or, I should say, as pleasurable as it gets in a palace. I could feel the plastic bag sliding around my feet as I concentrated on not falling over on the ice. Slip, slide, crinkle, crunch. I clenched my toes to give myself more grip and felt happy at least for one thing: my feet were warm. 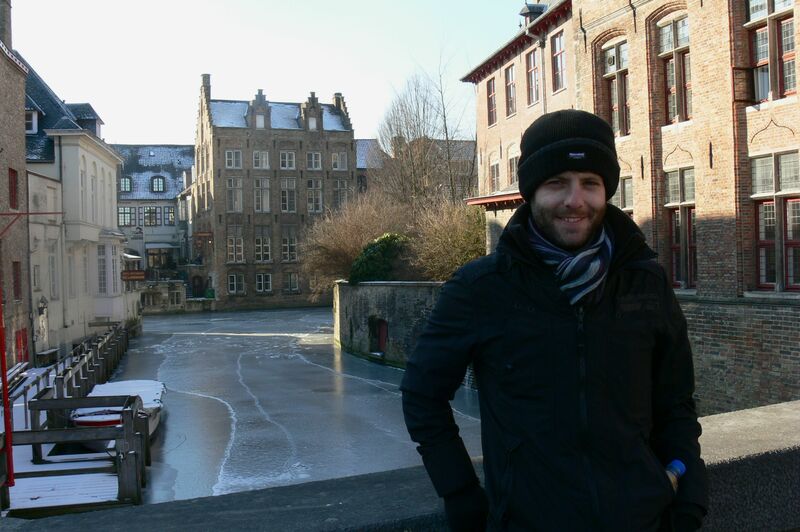 Having arrived in Bruges earlier in the day, the boy and I were freezing. We’d come ill-prepared: he in his Converse sneakers and me in my leaking boots. It was far below zero and we hadn’t experienced temperatures like this for a long time. When we’d made plans to come to the medieval Belgian town, I’d envisioned fluffy snowflakes falling to create a fantastical scene and romantic strolls across the town’s many bridges lining the canal. But I’d underestimated just how cold it would be. Luckily we weren’t alone – our four other friends along for the journey were also lacking sufficient layers or protective shoes to fight the freeze. 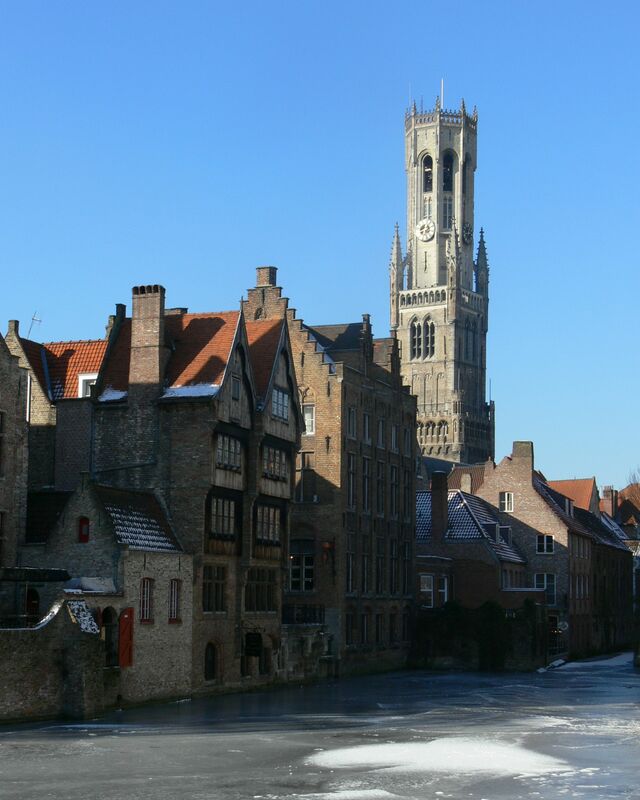 So, instead of sight-seeing, we spent much of our time holed up in the bars of Bruges, drinking beer (which I discuss in this post, here). But, there was still ample time to find myself laden with frozen, wet feet. There were the walks between the bars and back and forth to our abode, after all. I went for the homeless-chic look. Given the big problem was waterproofing, I thought about what keeps water out of things. And since I couldn’t wrap an umbrella around my feet, I opted instead for the humble plastic bag. After warming my socks on the radiator, I slid into their heated comfort and quickly enveloped my feet into Sainsbury’s bags before putting on my boots (warmed first with a hair-dryer). Now, I will admit: I may have had one or two of those strong Bruges beers before this burst of invention, but I still think it was ingenious. Walking out into the icy night, I decided I was not only a genius, but a bit of a fashionista too. Unfortunately, I have no photo evidence of my great invention. But I will say my feet stayed dry for the rest of the trip. And let me tell you: when it’s absolutely freezing and you manage to keep your feet toasty, it is incredibly pleasing! I stare at the menu longingly but with confusion. I want them all…every single bottle of beer on the menu at De Kuppe bar on Kupperstraat in Bruges looks appealing. But, given most sit around the 8% or 10% ABV mark, I have to concede: I will only get through a few. The boy and I had arrived with our friends in Bruges earlier that afternoon. It was colder than cold and we had to trudge through slippery snow if we wanted to see the town. So instead of freezing ourselves in the cultural endeavour of sight-seeing, we opted to hole up in one of the many bars the petite Belgian town has to offer, which worked perfectly for me. You see, I am a massive fan of Belgian beer – it is almost always my go-to beer as standard. It’s generally richer (without being gut-filling like a stout), has more subtle flavours and is crisp, despite being very strong. The history of beer from this region is equally enticing. 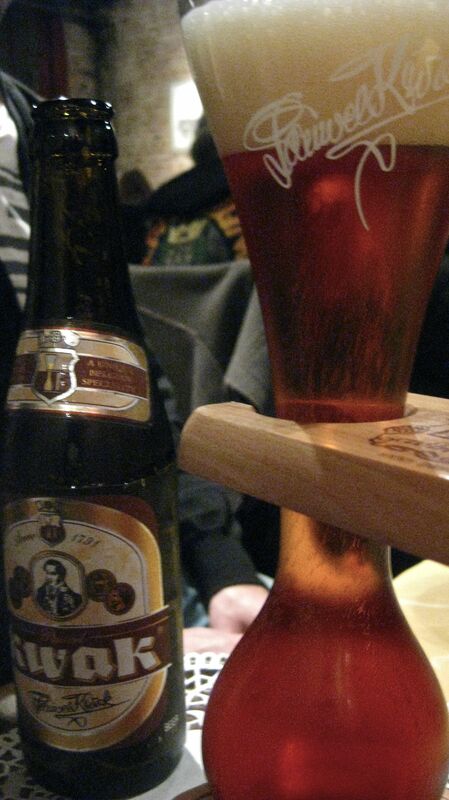 The famous Trappist beers, for instance, began being brewed in the late 19th century by monks in monasteries. 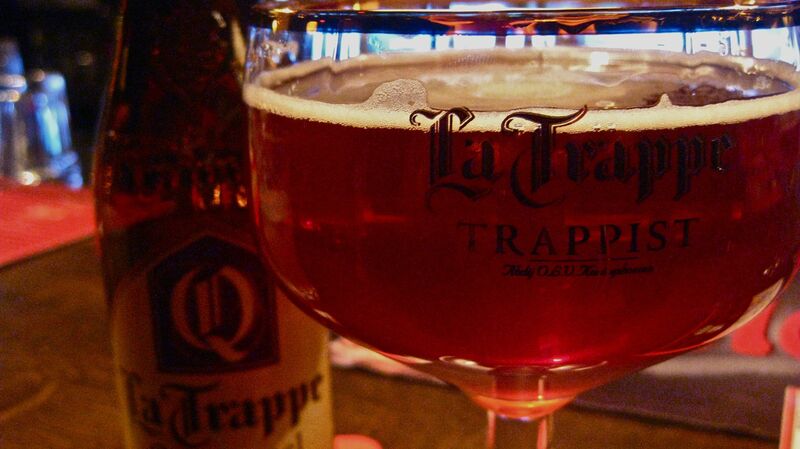 In order to be called a Trappist, the beer must still be made in the same fashion. There are six beer-producing monasteries that meet such distinction in Belgium, making brands such as Chimay, Westmalle and (my all time favourite) Rochefort. As such, when faced with a veritable book of beers, it was hard to know where to start. 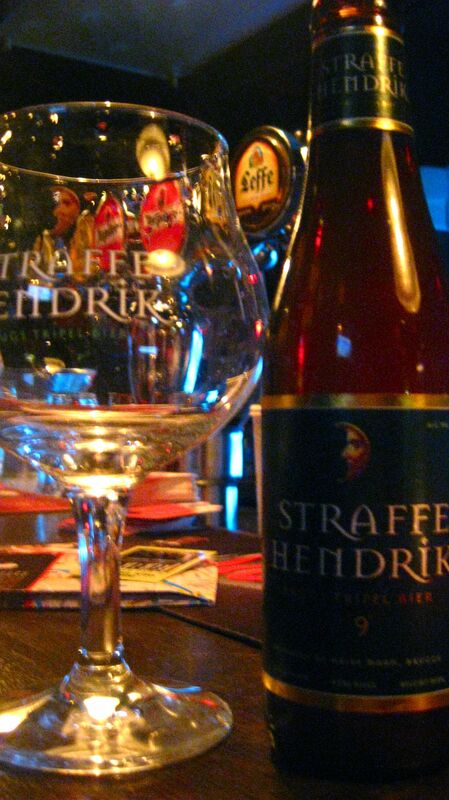 I opted away from ones I knew and started with a Straffe Hendrik, which is brewed in Bruges. This dark brown tripel beer comes in at 9% and is made from six kinds of malt. It has notes of toffee and brown sugar, and lots of hop. A delicious way to begin. I followed this with a Bush Ambrée, a hefty corker of a beer that has a wine-strength 12% ABV. The boy and a couple others joined in, swayed by the idea of drinking such a strong brew. Made in 1933, this beer is the strongest Belgian variety. But you wouldn’t know it – until you stand up of course. It is balanced between sweet and bitter, but doesn’t have the same “oomph” as the other Belgian beers I tried, despite being stronger. Next came Judas and La Trappe Quadrupel, which I only realised later is actually from the Netherlands. By the time I had sipped my way through those beers, it was time for bed. But with three more days in the winter wonderland of Bruges, I knew there was still time to work my way through a few more. 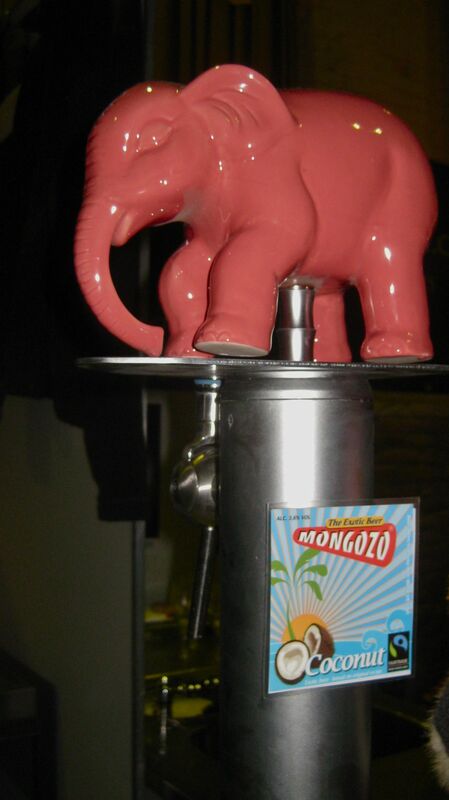 The pink Delerium elephant watches over the coconut beer. As luck would have it, the Bruges beer fest was going on at the same time we arrived – a fantastic and welcome surprise. Featuring more than 250 beers, it only added to the beer odyssey. There we managed to get through nearly 30 beers – only a drop in the ocean, but a good attempt I think. We tried the Troubadour Blond and Troubadour Obscura, two I had never heard of, along with the beautiful Val-Dieu Blonde and the super hoppy Martin’s IPA. There were hoards of intriguing fruit beers, such as the Floris Fraise and Peach, or the Banana, Coconut or Mango varieties from Mongozo. Interestingly, there was also a beer aged in whisky casks – the Bravoure, which was slightly sweet and stunk of smoked cheese. Despite this, it was intriguingly pleasant. And so the list goes on. After the beer festival, we continued on to the quaint De Garre bar, where beers such as Kwak and their 11% house beer. Maybe not the best choice after a few hours of beer drinking, but delicious and highly recommended. Kwak served up in a quacky wooden holder. 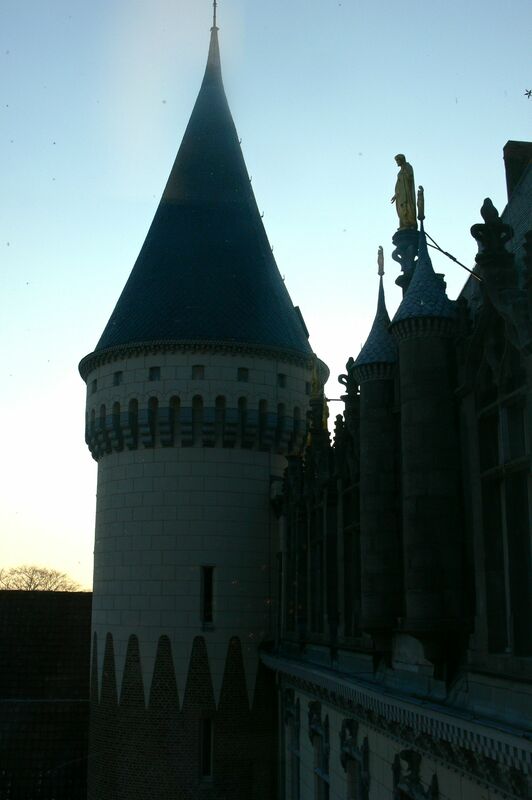 By the time we departed from Bruges, I was satisfied. I may have only tried 25 or 30 beers out of hundreds, but it was a great first stab at the books of beers in Bruges. I left with taste buds satiated, utterly bewitched by the Bruges beer scene.